I have looked around some, but didn't find anything great. There has been a lot of discussion of the G4's battery life. Including how some people get 2 hours of SOT, and some get 5 hours. But everyone's usage patterns are different. We don't even know if it's as simple as some people get good batteries, and some people get weak batteries, as a contributing factor. It would be nice if we had the option of running a standardized test on our phones, and comparing the results. Maybe even with the radios turned off, to eliminate signal-strength as a variable. Does anyone know of a good test like this? Or have a suggestion? Ideally it would be something we could all do, the same way. Something with a moderate CPU load, perhaps. That's a good idea. It is indeed baffling that there seems to be such variation in battery life, even taking the variables into account....or at least, the variables that we know about. I suspect that we shall have to invent our own test. Then we all do the same thing for a set time.....but what? 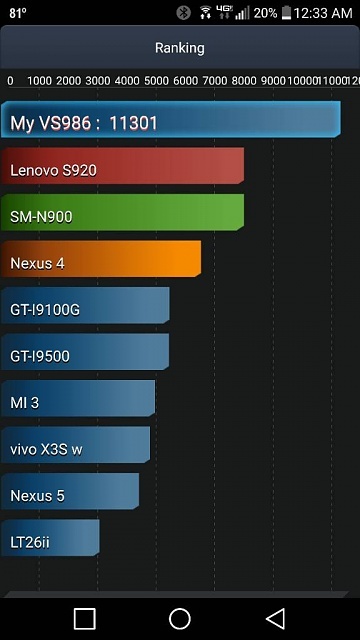 I downloaded the AnTuTu benchmark suite, as it has a battery benchmark function. I've never tried it before, so I don't know what kind of results it provides. That first app seems to act as a front-end, and downloaded this one, AnTuTu Tester, when I selected the battery benchmark. Maybe this can just be installed directly, to save a step. But, as a starting point, I'm trying that. You cannot do it in Safe Mode, as Safe Mode apparently does not allow running 3rd-party apps. And I thought it might be worthwhile to have something actively running, vs, say, sitting at a static web page. - Brightness set to 50%, auto-brightness turned off. - I did a Clear All in the app-switcher, then also opened Battery Monitor Widget again, to make sure it will also record the battery level info during the test, providing some other data to look at. - Airplane Mode turned on, to disable the cell radio. - WiFi enabled, as the test requires data access, and would not run without it. - Volume set to half. - It allows different ways of running the test. I *assume* this tells you that it will run until the battery drops to this level. I selected the 60% option, which specifies you must start with the battery at least at 70%. But we'll see what this actually means. Maybe it actually drains 60% *of* the battery, not drains to 60%. Unfortunately, with the non-linearity of the battery, if a test simply drains a certain percentage of the battery, we might actually get clearer results if NOT starting at 100%. That first 1% is weird, and forces people to charge fully before being able to do a test. Starting at something less than 100% might provide less-skewed results. Regardless, it needs to be done the same way every time. Starting at 100% is at least an easy place to start, for consistency. I'll see what results this test gives. Perhaps something like this could give a means to compare. Or if other testing options make more sense, please post suggestions! Okay, Antutu I've already got, and I've just downloaded the Antutu Tester app, which looks interesting. I can do nothing with it yet, since I'm charging (the app tells me to complete it), and it's gone midnight, but tomorrow I'll investigate further. Thank you for sharing your results, 804hokie! I'm a bit confused by how the test ran for me. I kept waiting for it to stop and say it was done. The green bar finally filled the progress bar, but it just kept going. I let it go until the phone finally shut itself down, at 1% battery. 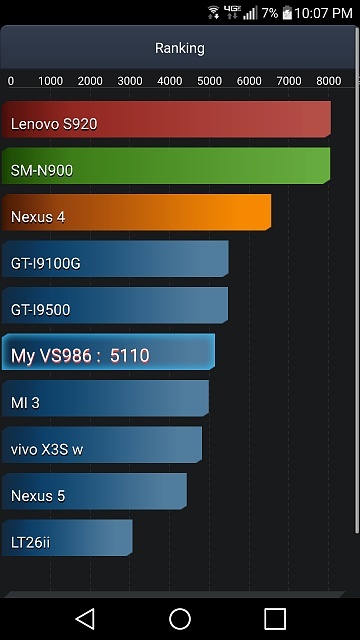 When I booted it back up, and went back into the AnTuTu Tester, this is the results it showed, I got a 5110. My phone is 2 days old, with 2 cycles on the battery so far. Again, I selected the 60% option, which said I needed to start with at least 70% battery. Hokie, what test type/duration did you select? I saw something online implying that the test you select (40%, 60%, 4%, etc) will impact the results. Did your test ever stop and say it was finished? Or after the green bar went across the screen, did you stop it manually? For some other context, aside from the number AnTuTu shows, I also had Battery Monitor Widget running. I started the test at 6:33, and the phone shut off at 9:55, so about 3:20 of benchmark/SOT (cell radio off, using Airplane Mode, with WiFi on). 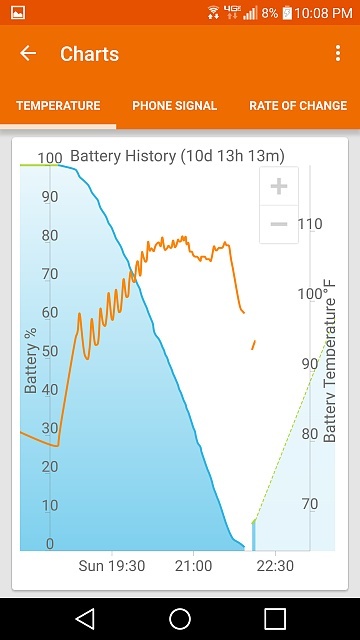 A screenshot from GSam is also attached, which shows the discharge, as well as the battery temperature during the test. Also, I wonder if it actually matters how you set your screen brightness. I think the benchmark sets the screen brightness on its own. Am I right that the phone cannot be used while the test is running? Or is the phone used normally and the test runs in the background? The test runs in the foreground. I had it in airplane mode. After the test finished (the phone died), when I turned the phone on again, and disabled airplane mode, a text showed up. I left the phone alone during the test. Since I ran the benchmark late last night, I ran it on the 4% test. It finished on its own then displayed the results. I'll run some more later. I ran the test at the 30% setting, expecting it to stop when it reached 20%....I guess I failed to understand how it works. In the end I stopped it at 19% and got what is probably a false reading, of 5270. Why does my HTC desire 510 keep restarting and \ or turning off? What is a pink unicorn Droid 4 and how can I get a Sim or fix it? What is battery temp too low to charge on my S6 Edge? Why does my Note Edge battery drain really quick?